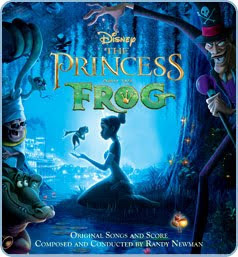 My daughter and I recently reviewed Disney's The Princess and The Frog Soundtrack on CD. 2. Down in New Orleans (Prologue) - Performed by Anika Noni Rose as "Tiana"
4. Almost There - Performed by Anika Noni Rose as "Tiana"
5. Friends on the Other Side - Performed by Keith David as "Dr. Facilier"
10. Down in New Orleans (Finale) - Perfomred by Anika Noni Rose as "Tiana"
My daughter and I both enjoyed this CD, my favorite songs being Never Knew I Needed performed by Ne-Yo and Ma Belle Evangeline performed by Jim Cummings. My daughter danced and sang along the moment I put the CD on, and can't name a favorite! Terence Blanchard, whom I never heard of before, did a great job on Trumpet and brought tears to my eyes. Since we first listened to this CD, my daughter hasn't stopped listening to it! She loves it and keeps begging me to buy the DVD of the movie when it comes out! One of you will win a copy of this CD for yourself! To enter, tell me who your favorite Disney princess is! This giveaway will end on February 22nd at noon EST. Disclaimer: This post was written for Family Review Network as part of a program for Walt Disney Records, who supplied the CD for review. My favorite Princess is Cinderella with Belle as a close second. My daughter is the fairest of them all though! !Love Disney and all the beautiful Princesses ,Thanks for the chance! My favorite is Belle from Beauty and the Beast. I do love them all though. I love your comment that your daughter is the fairest of them. Add my "A Simple Kinda Life" button to your blog. That would be Bell from Beauty and the Beast.